I'm really glad to see this on your blog. I'm new-ish here (and I have not yet clicked your link to your bullying posts - but I plan to). My son has been bullied, and will probably continue to have a problem throughout his entire school career. It makes me so sad, that at now ten, this has been going on since he was 5. We've spoken to schools, involved counselors, parents, teachers and everything we can possibly do. My son is smart. In fact he could skip to high school without any problems. He's also been classified as aspergers in the past. It saddens me so much to know that just because he's being himself, kids will tease him and be cruel. I do not automatically assume it's a bad home the bullying child comes from. Sometimes the homelife can be good - no abuse, etc. But when something or someone is different, plenty of people will fear it and place ridicule. It is wrong. I applaud you for standing up, in the unpopular position as the parent of a bully, and saying my child is having some issues and we are doing everything we can to make sure our child knows what they are doing is wrong and are trying to make sure they act appropriately in the future. 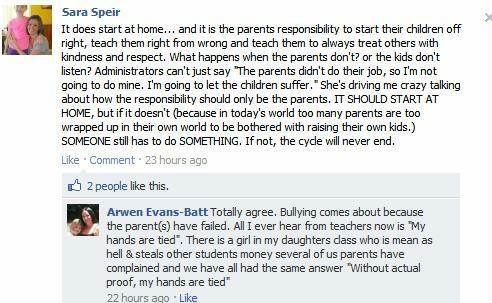 So many parents of bullies just place the responsibility elsewhere, if they acknowledge it at all. I hope your child chooses not to bully again. If they do, all you can do is try to correct the behavior and recognize it as a problem that everyone needs make better. I can honestly say I was never the bullied or the bully in school. But, I saw plenty of it. I think that bullying CAN be the result of poor parenting...but (hear me out) I also believe that it can happen DESPITE marvelous parenting. There is no black and white with these situations....there is no rule book....it's life, and life is difficult. You care for your kids more than anything else in the world. They get tons of love and affection from the both of you. This is a hurdle that the three of you are having to deal with....but there is no blame to be laid here. There are parents that can either cause (or chose to ignore) the situation...and that is the furthest from the case in your situation. To pile all cases of bullying into one big lump is ridiculous and very close minded. You just keep doing what you're doing.....being a great and loving parent!!!! First off, you're right. Not all parents of all bullies are crappy parents. I have never heard of the show you're referring to--is it local to your area in the US? Another thing is that the topic is a hot one right now--and it's relevant, so that's why there's a movie about it, actors, activists and ordinary people are passionate about this behavior in our society. It's damaging--that much we all agree upon--on both ends of the abuse. And where it starts, how to address it, must not be easy otherwise it would've been extinct by now, right? It's a touchy subject for many people. My own kids have had to deal with bullies as they've gone thru elementary, middle and high school. We reported some of the bullying to either the parents or the school and this was our experience: When we told the parents directly, they were either embarrassed and apologetic OR they were rude, smug and in denial. When we told the school, the behavior was kept in check and the bully was pulled into a school counselor's office and our child was no longer a target for the bully. At the very least, the bully knew he/she wasn't going to get their way with our child. Usually, they just moved onto another child as a target. One child threated to break my son's neck last year--in 5th grade. We did come to find out that that young boy was being abused at home. A girl that my daughter was being bullied by, threatened to kill her if she told anyone because as she said, "It'll be my word against yours." We told the parents instead of the school, and the parents denied that their little angel could've ever said such a thing. To this day, my daughter avoids being seen by this girl. I don't know why kids turn into bullies, but I am happy that it's become a topic of discussion and focus in our society. It is much-needed. As for your little girl, I can't think of one thing you could do better than what you're doing, Liz (and hubby). You can have peace in that. Sorry for the long comment. I just wanted to add for anyone reading comments out there that a good book to check out about bullying is The Bully, The Bullied and The ByStander. The book is about the full circle and that bullying is the problem of EVERYONE involved. Even the bystander. It really opened me up to speaking to my children about how it's important to help out if someone is being bullied. Bless You Liz. I truly love how you share your honest thoughts and I pray that more parents find this blog and hear what you have to say. Even though Teagan has gone through some rough spots, it's given you knowledge to share that very well will have wide reaching impact on this social situation. HUGS FRIEND!! Excellent post! Should be required reading for all parents. No matter what people might want to think, not everything is the parents' fault!! Nature vs. Nurture?? Sometimes nature really is the culprit! Oh Liz, my heart breaks for you. I know your family and I know the struggles that you go through with this. Just know that you are doing great jobs as parents and I know that T will pull through this. Hugs to you my friend! Wow. It's definitely not always on the parents. I agree with Mellodee... nature vs. nurture. I was listening to that show as well and I thought of you & Jeff. It made me sad that as usual, the first instinct is to blame the parents, especially when I know how much you have all been trying to do your best with Teagan. I'm sorry for what those people said, it was callous and not very well thought out, on all ends of the spectrum. People fear what they don't know. I completely understand and completely agree. We had one child who was the one to poke, antagonize, and harass other kids. Guess what? We love our kids and take care of them but that child has issues and he always needed more supervision until his emotional maturity caught up with his age-maturity. We have homeschooled for 3 years partly because of this need and he is a totally different kid. Also? I hate classifying kids. To classify my child as a "bully" would mean that he is still a bully. Which he's not. He is a fairly average kid now. If we were to classify the children who are picking on other kids as bullies for the rest of their lives, how do we classify the kids who are picked on? As "victims"? Is that how anyone wants their child labeled? As a victim? Human beings have some horribly twisted, inborn need to have a pecking order and it is never as strongly present as it is in the school years. I hope your daughter is having a more peaceful year. I hope the school and other parents in your district are on the same page for ALL of the kids: that they want all of the kids to grow up into responsible, strong adults. I can completely understand your frustration and you are right - parents are not always to blame. Research does show that home environment CAN be a significant factor in bullying, but it isn't always. The simple fact is, any one of our children could end up being a bully at some point, even if we are working really hard to try to keep it from happening. I can also understand how so many are quick to judge/blame the parents. It's an emotional and complex issue. People need someone to blame, and they want to believe there is an easy answer/fix. There isn't. I appreciate your writing about this and sharing it on The Mom Pledge's page. Thank you!